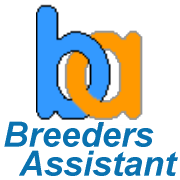 Breeders Assistant for Dogs has a number of features specifically tailored to the needs of dog breeders. Breeders Assistant knows about recognized UK Kennel Club breeds and colors (updated May 2018). So when entering a dog into Breeders Assistant you can select the breed & colour from lists of colours known to be present in each breed. It includes the names of the recognized Kennel Club titles in its title list. Breeders Assistant knows about UK KC show awards in its show records. Breeders Assistant is aware of the recognized breeds and colors in virtually all recognized dog breeds (updated May 2018). This means that when adding a dog you can select the breed & colour from lists of colours known to be present in each breed. It knows about titles recognized by AKC (for conformation, agility, field trial and obedience). Breeders Assistant knows about FCI breed names including FCI breed groups and numbers. It can automatically fill in the breed/color details for a dog. If you key in the breed number it can look up the rest from its inbuilt breed/color list. It understands the inheritance and color phenotypes for most of the understood breed/color genes: Agouti Coloration, Albino, Blue Dilution, Chocolate, Color Intensity, Dominant Black/Brindle, Dominant White, Extension, Flecked, Grey Merle Dilute, Greying, Harlequin, Harlequin Tweed, Merle, Roan, Rufous, Super Extension, Ticked and White Spotting. It is supplied with genetic configurations for over thirty breeds: Afghan Hound, Akita, American Cocker Spaniel, Australian Shepherd, Basenji, Beagle, Border Collie, Boxer, Brittany, Bulldog, Chihuahua, Collie, Corgi, Dachshund, Dalmatian, Dobermann, Elkhound, English Cocker Spaniel, English Setter, English Springer Spaniel, Field Spaniel, Fox Terrier, Foxhound, French Bulldog, German Shepherd, Golden Retriever, Gordon Setter, Great Dane, Greyhound, Irish Setter, Irish Wolfhound, King Charles Spaniel, Labrador Retriever, Newfoundland, Old English Sheepdog, Papillon, Pekingese, Pointer, Pomeranian, Poodle, Pug, Rhodesian Ridgeback, Rottweiler, Schnauzer, Scottish Terrier, Shetland Sheepdog, Weimaraner, West Highland White Terrier, Whippet, White Shepherd and Yorkshire Terrier. In addition we also supply a generic configuration that includes all color and disease genes listed on this page and can be used for other breeds not specifically covered above. The genetic configurations for the different breeds are built into the product, and are normally fixed. However, it is possible to purchase a separate 'user modifiable' form of genetic configuration that is supplied as a text file, which defines the genes, alleles, and rules governing their interactions (e.g., which genotypes give rise to particular phenotypes such as coat colors). For further details of this please contact the customer service help desk. For further details see advanced genetics.